The following is an excerpt from a journal I kept while serving as an LDS missionary in Texas. 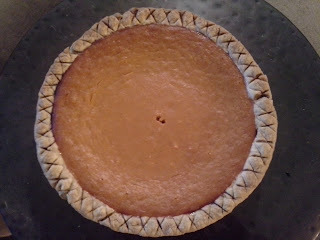 It contains, among other things, my first encounter with Sweet Potato Pie. Please keep in mind this was written by a kid who was very young and very white... thank you. "While knocking doors and meeting folks on California St, we walked up a ramp to a dark screen door. We knocked and were greeted by a cheerful African-American woman who, to my surprise, seemed to recognize us. She invited us in the house, turned off the Price Is Right, and left us in the living room with her much older and very withered husband. I soon realized the man was blind. He introduced himself as Reverend Smith, of Big Lake's Bethlehem Baptist Church. His tone was cautious, yet defiant. He challenged our motives as missionaries, and quizzed us about the gospel of Christ. I'll admit to feeling a little perplexed, having just been invited into the home and then interrogated all in the space of a few minutes, but after our sincere answers, he accepted us as servants of the Lord and ordered his wife to plate us up some leftover "soul food." 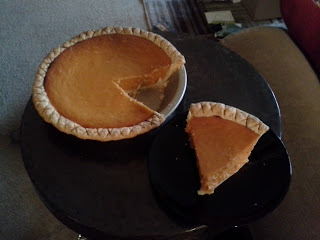 We were even given our own piece of sweet potato pie. Completely awed by the kindness and generosity, my companion Elder Wilcox voiced a desire to help with the daily cleaning of their church. "Can we do that?" I thought. "Wouldn't our time be better spent cleaning OUR church?" But trusting my new companion, I went with him, Reverend Smith, and the good Rev's wife to their chapel next door. We spent the next 30 minutes or so vacuuming up and down the pews. Kind words and thanks were exchanged, and I witnessed the first change of attitude in Big Lake. My own." Reverend Smith passed away not long after that. I felt so grateful we had met him. Our meeting was brief, but I felt a true connection to him and his congregation. We cleaned their church, and he gave us his sweet potato pie. In honor of building bridges and changing attitudes, here's a recipe for Sweet Potato Pie, dedicated to Revered Smith and that little town of Big Lake. This pie is sweeter than pumpkin, but also brighter in color. Give it a try, and give it away. You won't regret it. Using an electric hand mixer, combine the potatoes, sugar, butter, eggs, vanilla, salt, and spices. Mix thoroughly. Add the milk and continue to mix. Pour the filling into the pie crust and bake for 35 to 45 minutes or until a knife inserted in the center comes out clean. (For me, an additional 20 minutes.) Place the pie on a rack and cool to serve.